«Dear Child Jesus, soon you will descend on earth. You will bring joy to children, and I will be joyful, too». This is the beginning of a 1934 Christmas letter, as reported by the web site korazym.org. The author was a 7 years old child. It was scripted in Sütterlinschrift, the typical italic calligraphy of that time. The author was Joseph Ratzinger, Pope Benedict XVI. What is most striking is that little Joseph does not ask for toys or sweets. He asks for the Schott, one of the first books in German with a breviary and missal (with its text in Latin also). At that time, two editions were available in Germany: one for children and one for adults. Little Joseph, through that book, begins to love the liturgy that sets the rhythm of his family’s life. Little Ratzinger then asks for a vestment to celebrate Mass. No surprise, because the Ratzinger brothers used to pretend to be “parish priest”, and their mother made vestments for that. «We pretended to celebrate Mass – Georg Ratzinger, the Pope’s brother, told the American monthly Inside the Vatican – and we had vestments made for us by our mother’s seamstress. In turns, one of us was the priest and the other the altar boy». Finally, little Ratzinger asks for a «Jesus’ Heart» i.e. an image of the Sacred Heart, which his family was very devoted to. Just an anecdote. But perhaps one should keep in mind this anecdote when Benedict XVI delivers his speeches. Whenever he defends family, there is something about memories of his own family. That it was a happy family, which life rhythm was set by liturgy, and where all rejoiced with one another. It was a family in which it was sensible to be, because it represented the best for a child’s growth. When he became theologian, Joseph Ratzinger expanded his reflection on the meaning of family, based on the Holy Family of Nazareth. Through the example of the Holy Family, he wanted to explain why a «traditional» family was needed. This defense of family started on strictly theological basis. But also on a rational basis. 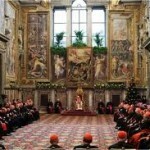 An idea the Pope has put front and center in his Christmas address to the Roman Curia. 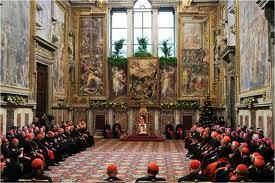 In that address, the Pope generally looks back at the life of the Church in the year that is coming to an end. As usual, the Pope flew high. No hint of Vatileaks, nor of internal problems: in the end, these problems really do not amount to much, just petty miseries of the human condition, when compared to the Church’s challenges and agenda. So, Benedict XVI put on the table three issues that marked the Church’s life and that will be on the agenda for the next ten years: family, dialogue, and new evangelization. The Papal address starting point is the family. The Pope approaches the topic through the arguments which the Chief Rabbi of France Gilles Bernheim made in defense of the traditional family. Bernheim also sent to the French President François Hollande a 25 pages brief, to explain all the reasons why he and his community are against «marriages for all». The Pope states: before, the family was in crisis due to a misconception of freedom; today, the very idea of man is in crisis. This crisis has a specific name: gender. It is at the same time a neutral and lethal name, as is much of the new «vocabulary» promoted in United Nations documents and continuously denounced by Holy See officials. In the end, it is the same agenda of little Ratzinger. He asked for a Schott as a Christmas gift, a book of liturgies, to lock himself in step with Jesus, starting a long walk in life that brought him to the Papacy.